After the train wreck travesty that was "Tormato" there was nowhere for Yes to go but up, even if it meant shaking up the esteemed board of directors. The potent magic spells they had once cast like sorcerers were long gone and to have kept the same boys in the band at that point would have been counter productive to say the least. Exit stage left co-founder Jon Anderson and the extraordinary keyboard virtuoso Rick Wakeman. I have to confess that I surprised myself recently when I listened to "Drama" for the first time in probably ten years. Maybe it was because I had felt so badly betrayed by their aforementioned previous fiasco or because Jon and Rick had hit the road but, for whatever reason, I had developed a rotten attitude towards this album that, frankly, was unfair. Don't get me wrong now, it's no "Fragile" or even "Tales from Topographical Oceans" by a country mile but it is so much better than "Tormento" that, in comparison, it's a freakin' masterpiece of progressive rock. They really weren't doing themselves any huge favor by starting things off with what sounds like the soundtrack for a cheap monster movie on "Machine Messiah." It might be right for Black Sabbath but it's just not Yes music. Fortunately they get past that and take you into some very clean vocal harmonies on the verses and things get better in a hurry. The instrumental segment is exciting and even includes the sound of a cathedral organ, a Yes trademark. Geoff Downes is no Wakeman but his performance throughout the proceedings is better than average and he never overplays his hand. And, as far as the subject matter goes, if they were worried about HAL taking over in 1980 they would have been terrified to know that by the end of the century there would be a PC in almost every home. So much for warnings. "White Car" is one of the shortest songs in the history of this group at 1:21 and it passes by so quickly that it's hard to form an opinion about it one way or another. I do get the impression that it's about Jon Anderson because of the lyric "I see a man in a white car/Move like a ghost on the skyline/Take all your dreams/And you throw them away." Evidently they weren't ready to make nice just yet. "Does It Really Happen?" is next up and it features a very solid thematic idea built on top of Chris Squire's galloping bass riff. There's a tasteful vocal break in the middle and Chris shines in the spotlight on the way out. I never have figured out what "It" is that they're singing about. "Into the Lens" is the best song on here. With a staccato beginning grabbing you by the lapels it flows directly into an excellent melody and a round of high quality vocalizations. It's an incredibly tight track and drummer Alan White is his usual exemplary self. The creative arrangement and state of the art production (from Eddie Offord) are a welcome throwback to much better Yes days. Singer Trevor Horn's not a bad vocalist but his ridiculous phrasing on "Run Through the Light" marks the first instance where I truly miss Jon Anderson on this album. The chorus is decent and Steve Howe's guitar comes riding in like the cavalry to attempt to save the tune but for me it remains the low point. "Tempus Fugit" is an uptempo rocker that literally sizzles. Howe and Squire set the pace for the band to follow and the harmony work is spot on. It even has some interesting lyrics with "If you could see all the roads I have traveled/Towards some unusable last equilibrium/Run like an athlete/And die like a dead beaten speed freak/An answer to all of the answers to - Yes." Speed freak? Those aren't your normal Yes lines at all. Okay, so it's not in the same universe as their best but it was definitely a step forward. I avoided listening to "Drama" because of preconceived notions but when I take it in without bias I find that it certainly doesn't deserve the horrible rap it often receives. 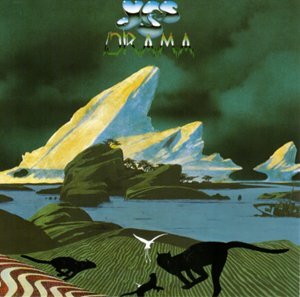 With the return of Roger Dean's fantastic cover art, more group focus and renewed enthusiasm for their work Yes went a long way towards redemption with this project. I give it 3.5 stars.